The viscosity of hydrophobically modified alkalisoluble polymers to different hydrophobic macromonomer concentrations in the presence of various concentrations of anionic surfactant and salt were investigated. Associative polymers containing both ionic sites and small number of hydrophobic groups were prepared, and their thickening properties in aqueous solution were investigated. Solution polymerization was used for obtained the different polymers. Relationships between hydrophobe, sodium dodecyl sulfate (SDS) and salt (NaCl) concentrations are proposed. Owing to the competition between attractive hydrophobic interaction and repulsive electrostatic interactions, such hydrophobically modified polymers exhibit various rheological behaviors in aqueous solution depending on hydrophobic macromonomer, SDS and NaCl concentrations. Key words: Associative polymers, viscosity, thickening properties. Se investigó la viscosidad de polímeros modificados hidrofóbicamente a diferentes concentraciones de macromonómero hidrófobo en presencia de tensoactivos aniónicos y sal a diferentes concentraciones. Se prepararon polímeros asociativos que contenían sitios iónicos y una pequeña cantidad de grupos hidrófobos y se estudiaron sus propiedades espesantes en solución acuosa. Se utilizó la polimerización en solución para obtener los diferentes polímeros. Se proponen las relaciones entre hidrófobo, dodecil sulfato de sodio (SDS) y sal. Debido a la competencia entre las interacciones hidrofóbicas de atracción y las interacciones electrostáticas de repulsión, los polímeros modificados hidrofóbicamente presentan diferentes comportamientos reológicos que dependen de la concentración de macromonómero hidrófobo, SDS y NaCl. Palabras clave: polímeros asociativos, viscosidad, propiedades espesantes. Watersoluble polymers modified with relative low amount of a hydrophobic comonomer (<5 mol%) have been the subject of extensive research efforts during the past decade because of their interesting rheological behavior in aqueous solution [116]. Intermolecular associations give rise to enhanced viscosification properties. On the other hand, polyelectrolytes have been known for a very long time as efficient thickeners, specially in saltfree solution, because of intermolecular chargecharge repulsions that lead to coil expansion. For the production of thickeners with improved properties, we therefore considered watersoluble polymers containing both hydrophobic and ionic groups in order to combine the advantages of polymolecular association and the polyelectrolyte effect [1722]. To enhance the performances of associative polymers in paint and coating application, a better understanding of the associative interactions between associative polymers and salt and surfactant is needed. Depending on the nature of the additives, the thickening behavior can either decrease or increase. Over the last 30 years, most of the studies focused on the behavior of hydrophobically modified ethylene oxide urethane (HEUR) thickeners. [16] Some studies on hydrophobically modified alkalisoluble emulsion (HASE) polymers have recently been reported [712]. HASE polymer can be classified as a hydrophobically modified polyelectrolyte. When neutralized in aqueous solution with suitable base, the latex particles are ionized as a result of the acidbase reaction. The partially neutralized polymer becomes water soluble and the polymer chains expand owing to the mutual repulsion of the negative charges along the polymer backbone. Beyond a certain polymer concentration, the hydrophobic moieties along the polymer backbones associate intermolecularly to form a network structure. This network structure greatly increases the solution viscosity and thickens the solution significantly. Addition of small salt concentrations removes the electrostatic repulsion between charges on the polymer backbone, which decreases the stiffness of the polymer chain. The conformation changes of the polymer chain from one of high to lower persistent chain length disrupt the intermolecular junctions. This causes the polymer network to collapse, reducing the hydrodynamic volume occupied by polymer chains and micellar clusters, thereby lowering the viscosity. By introducing sufficient amounts of surfactant, the active junctions can be strengthened by the adsorption of surfactant molecules decreases the functionality of polymer junctions. Consequently, a larger number of mechanically active junctions are assembled, which give rise to enhanced viscosity. We report here some results of an investigation into the synthesis, characterization, and solution properties of different polymers containing methacrylic acid, ethyl acrylate and a hydrophobic macromonomer obtained by solution polymerization. The specific features of the copolymerization methods used as well as their influence on the copolymer microstructure were examined. The aqueous solution properties of the copolymers were studied in the steadyshear viscosity properties in the absence and the presence of surfactant and salt. We compared the thickening abilities of the various samples, giving special attention to the effect of hydrophobic macromonomer, surfactant and salt concentration. Figure 1 shows the apparent viscosity (η) as a function of the shear rate ( ) for the four samples studied. The B0 sample shown a Newtonian behavior to all the shear rate studied. The samples containing hydrophobic groups (B1,B2 and B3) shown a defined region (slow ) with constant viscosity (η0) which changes to a shear thinning behavio at higher. shear rate; that is, there is no detectable variation of η with , when the rate is augmented, the Newtonian behavior is followed by a shearthinning behavior; this shearthinning is due to the breakdown of the intermolecular hydrophobic interaction, which produce a decrease in viscosity. We observed that the viscosity is increase when the sample have more hydrophobic macromonomer, that is, B0 < B1< B2 < B3. 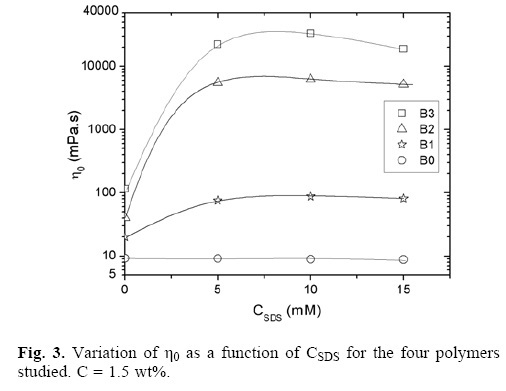 Figure 2 shows the variation of the steadystate viscosity η as a function of shear rate for B3 sample at different SDS concentrations, in aqueous solution. The sample without SDS present a large Newtonian behavior follow for a small shear thinning behavior, and low viscosity (~ 100 mPa.s); when SDS is aggregate, the viscosity increases drastically, and the samples exhibit a stronger shear thinning behavior. The maximum viscosity observed as a function of SDS was at 10 mM concentration, followed by a decrease of viscosity at 15 mM of SDS. Figure 3 shows the n0 as a function of SDS concentration (CSDS) for the three polymers studied. It is observed that the addition of surfactants to the solutions of associative polymers has dramatic effects on the viscosity of the medium because links represent associative polymer micellar highaffinity domain interactions with surfactants [2340]. In many cases, has been found that this effect is strongly dependent on the nature and level of addition of surfactant. The classical behavior of this mixture associative polymer/surfactant is: there is an increase in viscosity when SDS is added, reaching a maximum in this case the three samples presents this maximum to CSDS = 10 mM, to concentrations SDS higher (> 10 mM) show a decrease in viscosity. This behavior is attributed to the fact that the added surfactant molecules allow the formation of more hydrophobic domains and the formation of surfactantpolymer micelles. As a result, the average distance between micelles decreases. This allows the conversion of bound chains interlinked networks and strengthening networks with corresponding changes in viscosity, reaching an optimal concentration of surfactant. The observed decrease in viscosity above this surfactant concentration is attributed to an increase in the number of surfactant micelles lose their chance meeting with a hydrophobic group of a different polymer chain in a given micelle, and thus the network hydrophobic groups dispersed and solubilized by the surfactant. The B0 behavior is already reported for the system without hydrophobic groups, a Newtonian comportment as a function of the surfactant concentration is observed at all the surfactant concentrations studied, the surfactant quantity added not modified the viscosity of the samples due the absence of hydrophobic groups. 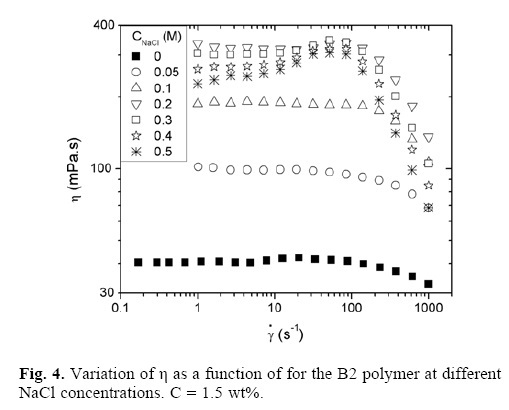 The different viscosity presented by the samples (B3 > B2 > B1 > B0) is due to hydrophobic concentration in the terpolymers. 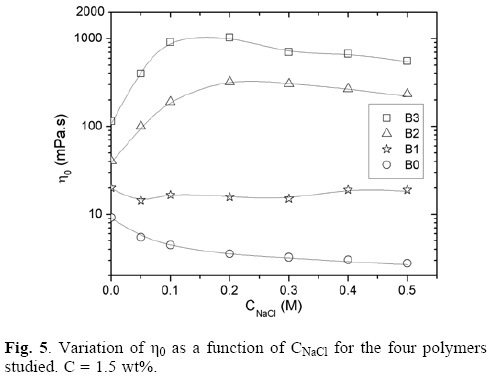 Figure 4 shows the variation of the steadystate viscosity η as a function of shear rate for B2 sample at different NaCl concentrations, in aqueous solution. From 0 to 0.2 mM of NaCl the samples show a pronounced Newtonian behavior followed by a shearthinning effect, from 0.3 to 0.5 mM the samples present a defined region (slow ) with constant viscosity (η0) followed by a marked shearthickening effect and finally a shearthinning behavior. This shearthickening effect is due to breakdown of the intramolecular associations and the formation of new intermolecular unions. 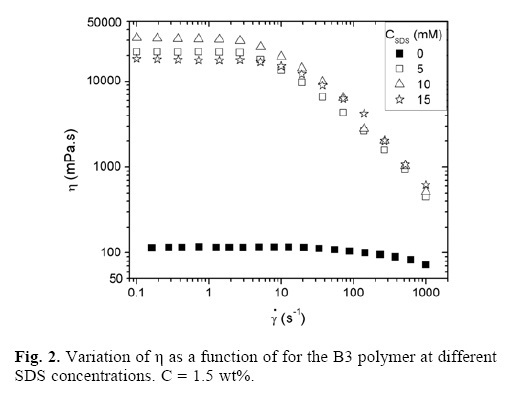 Figure 5 shows the η0 as a function of NaCl concentration (CNaCl) for the four polymers studied. It is observed that the addition of NaCl to samples B3 and B2 have the same behavior shown for the addition of SDS, i.e. the viscosity increased to a maximum followed by a decreased, this is possibly because at low NaCl concentrations, the molecules of this salt will be positioned in the middle hydrophobic junctions causing that the union is stronger, giving as result the increase in viscosity. Wang et al. [4142] observed that the addition of salt at the appropriate level can enhance the viscosity of C18modified PAA, due to the conformational changes and the enhanced interchain aggregation resulting from hydrophobic interactions. Upon the addition of NaCl, the polymer exhibits a transition from a nonaggregated to an aggregated polymer cluster, provides an electrostatic shield between charges along the polymer backbones. The polymer backbone contracts, which disrupts the intermolecular associative junctions, yielding smaller clusters with predominantly intramolecular association. The reduction in the active junctions has a significant impact on the viscosity (decrease of viscosity), this behavior has been observed also for Tan et al. [4345]. While the sample B1 shows a Newtonian behavior, i.e. no change in viscosity at all NaCl concentrations studied, this is possibly due to the low concentration of hydrophobic groups in the middle. Due that the behavior is the same shown for the addition of surfactant with hydrophobically modified polymers, the scenario can be the following (i) At low NaCl concentration, there is noncooperative binding of the salt to the hydrophobic entities leading to the formation of both mixed unifunctional and plurifunctional aggregates. In a mixed unifunctional aggregate, only one hydrophobic entity or two entities belonging to the same polymer molecule are incorporated. A mixed plurifunctional aggregate contains several hydrophobic entities from different chains and therefore acts as a crosslink. The latter can be obtained either by a bridging effect of the salt onto several associating sequences initially isolated, or by binding of the salt onto a preexisting crosslink. In both cases, this leads to a strong enhancement of the viscosity of the system. (ii) At high salt concentration, the hydrophobic groups are saturated with salt and the excess of salt is localized in the aqueous medium resulting in the disruption of electrostatic repulsion of the polymer and the reduction of viscosity. While the B0 sample shows a decrease of viscosity when the NaCl concentration is increase, this is possibly due to that the polyelectrolyte does not contain hydrophobic groups, the salt instead of going to lie in the hydrophobic parts are dispersed in the aqueous medium to produce the breaking of the electrostatic repulsion and the decrease of viscosity. The systems investigated here are hydrophobically modified polyelectrolytes obtained by solution polymerization in which the hydrophobe content was varied. The influence in the viscosity as a function of surfactant and salt concentration were investigated. The resultants of the interactions of polyelectrolyte with surfactant showed a typical behavior of associative polymers, with first an increase and then a decrease in the values of zeroshear viscosity. While for the case of the influence of salt, the polyelectrolyte which does not contains hydrophobic groups is observed a decrease in viscosity as the amount of salt is increased, this is due to breaking of the electrostatic repulsion present in the polymer, For polyelectrolytes containing hydrophobic groups have a surfactantlike behavior, i.e. the viscosity increases to a maximum followed by a decrease of it in function of the amount of salt, this can be attributed that the salt initially is localized in the hydrophobic groups present in the polyelectrolyte resulting in increased of viscosity, at high salt concentrations, the hydrophobic parts are saturated with salt and the excess of salt is dispersed in the aqueous medium to produce the breaking of the electrostatic repulsion and the decrease of viscosity. Polymer synthesis. Terpolymers of methacrylic acid (MAA), ethyl acrylate (EA) and a macromonomer (MM) were prepared by solution copolymerization method. Three different polymers were prepared. Typical experimental condition were as follows: In a flask ball three neck, equipped with condenser, magnetic stirring and oil bath temperaturecontrolled, were added the ethyl acrylate (EA), methacrylic acid (MAA), macromonomer (MM), ethyl alcohol (EtOH) and 1 wt% of AIBN with respect to total feed monomers, immediately the flask was keep in the oil bath at 70 °C. Polymerization was carried out for 2 h under an argon atmosphere. A polymer without MM was synthesized using the same reaction conditions to compare the viscosity. After the polymerization, tetrahydrofuran (THF) was added to dissolve the polymer, subsequently the polymer was precipitated and purified using hexane. The polymer was dried under vacuum at 50 °C. The total solid concentration in the polymerization was keeping constant to 63.1 wt% in the systems. The characteristics of the polymers are given in Table 1. Molecular Weight. The molecular weights of the samples were determined by size exclusion chromatography (SEC) (using THF grade HPLC as solvent), on a HPLC Hewlett Packard serie 1100. Characterization. The composition of polymers was determined by 1H NMR spectroscopy using 1 wt% solution in CDCl3 at room temperature in a JEOL 300 MHz spectrometer. Sample preparation. Solutions of polymer were prepared by directly dissolving of 1.5 wt% of polymer into deionized distilled water, all of the polymer solutions were neutralized to a pH ~ 9 with small amounts of concentrated 2amino2methyl1propanol (AMP) solution, the correct amounts of SDS (5, 10 and 15 mM) and NaCl (0.05, 0.1, 0.2, 0.3, 0.4 and 0.5 M) were added to the system and each solution was gently stirred until the solution were homogeneous. Rheological measurements. Rheology determinations were performed at 25 °C in a Paar Physical UDS 200 controlled stress rheometer using either a cone and plate geometry (2° angle and 50 mm diameter). 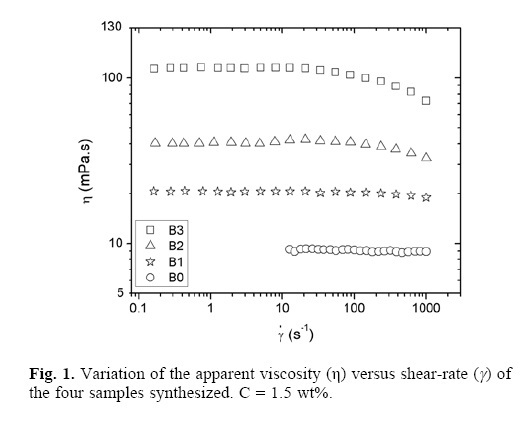 The zero shear viscosity (η0) was obtained by extrapolation of the apparent viscosity at very low shear rate. The authors wish to thank the Mexican National Council for Science and Technology (CONACYT) for the financial support to this work, through grant C0146035/A1. The authors also thank Marcelina Sánchez Adame for her help in the experimental characterization.